Many of you will have noticed the tree and guard that was damaged by a car during the recent snow and ice on Langham Parade. The council are looking to have both replaced within four weeks. I will keep you updated with progress. Just to let everyone know that the various odds and ends around the neighbourhood have not been forgotten about – the construction teams are currently working across the borough, but the various elements that we want finished will be carried out asap. I am hoping that the tiles for the Art in the Community project will be sent to the framers next week – a process that will take approx 2 weeks. At that point we will be in the position to install the seven street names in the designated locations (which will be published in due course). I am working to get the additional planters and litter/dog foul bins. I am still in discussion with Haringey council and the Safer Neighbourhood Team regarding Langham Place and I will have more information on various measures shortly. 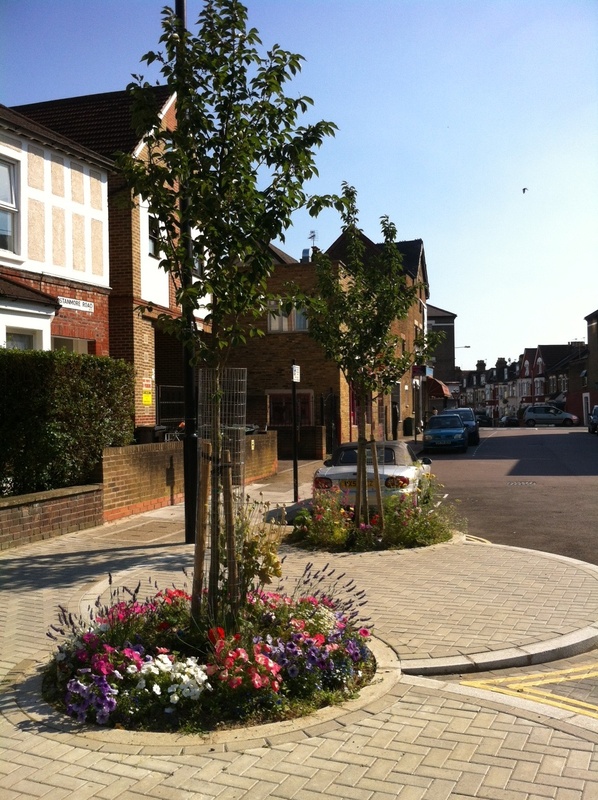 Two additional trees are due to be planted, one near the bend on Lagham Road and the other on Stanmore Road – we are currently trying to coordinate with the various departments to make this happen. The damaged tree guard at the junction of Carlingford and Stanmore will be repaired shortly. 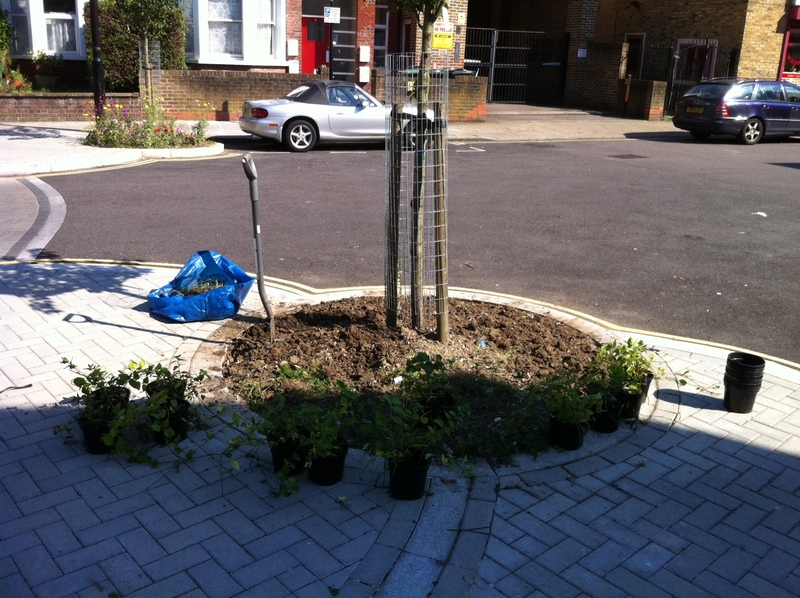 Finally, we will be looking to plant additional lavender plants in the tree pits at the junction of Waldeck and Stanmore Roads within the next fortnight. 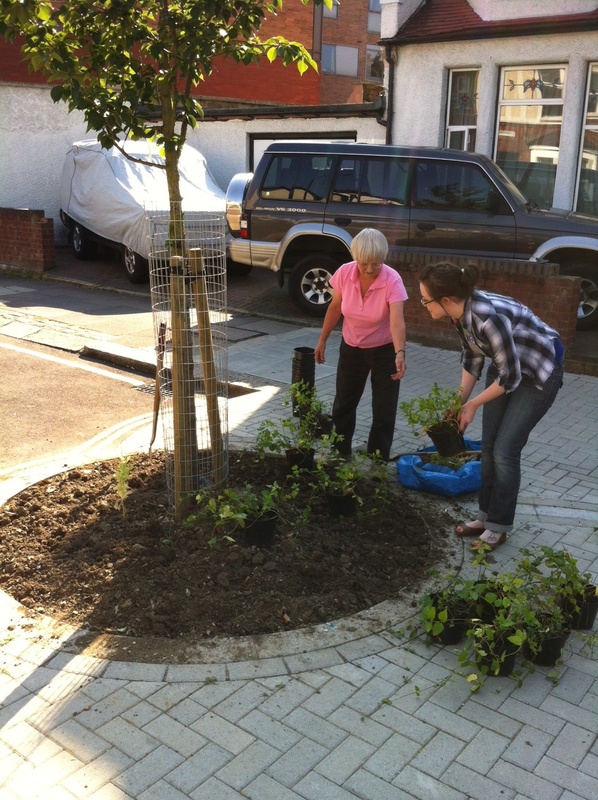 Last night residents came out to finish off the tree pit planting at the junction of Stanmore and Waldeck Roads. 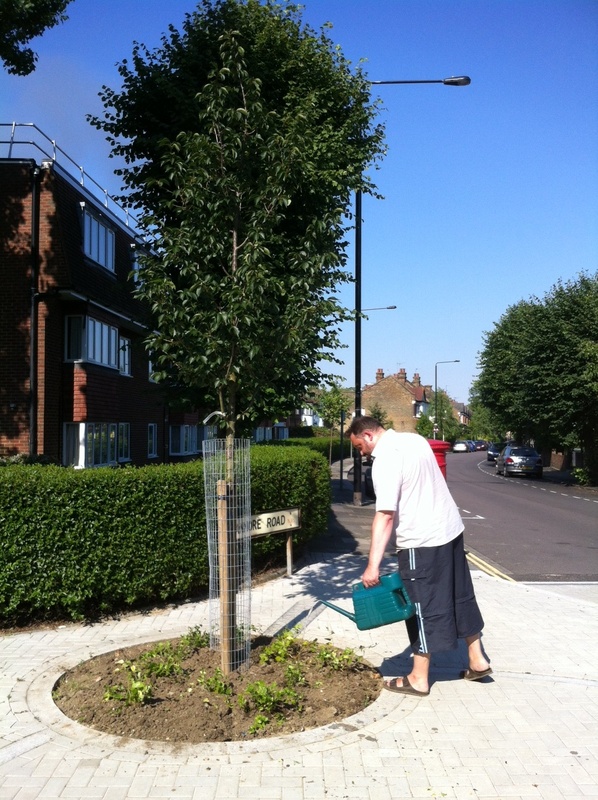 The hard work compliments the wonderful planting already established by residents. Some more plants are due to go in over the next couple of weeks and residents will keep on top of the watering to ensure all the plants survive the warm weather. 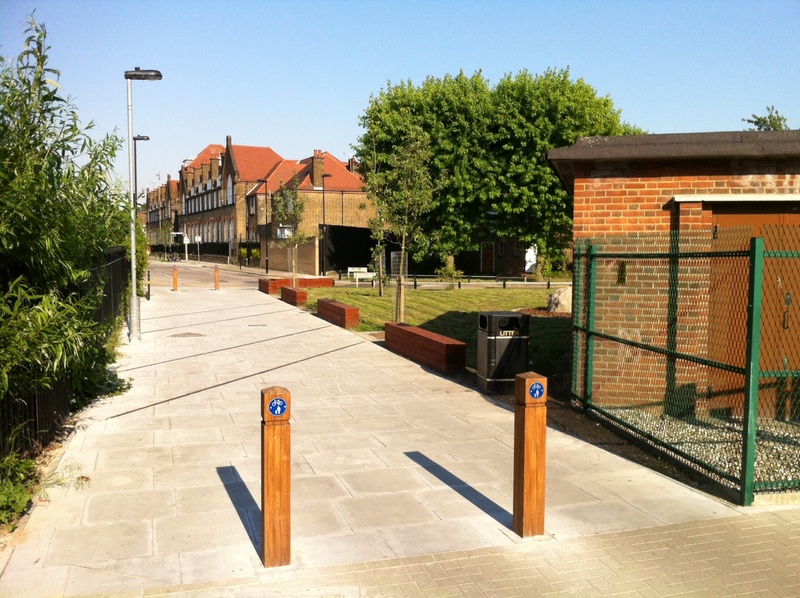 The greenspace next to the allotments (between Langham Place and Ivatt Way) is finally finished (with the exception of the lamp post which is due to be painted). Residents wanted the area to feel safer, represent more than just a dogs toilet, and provide a green anchor point to the neighbourhood. 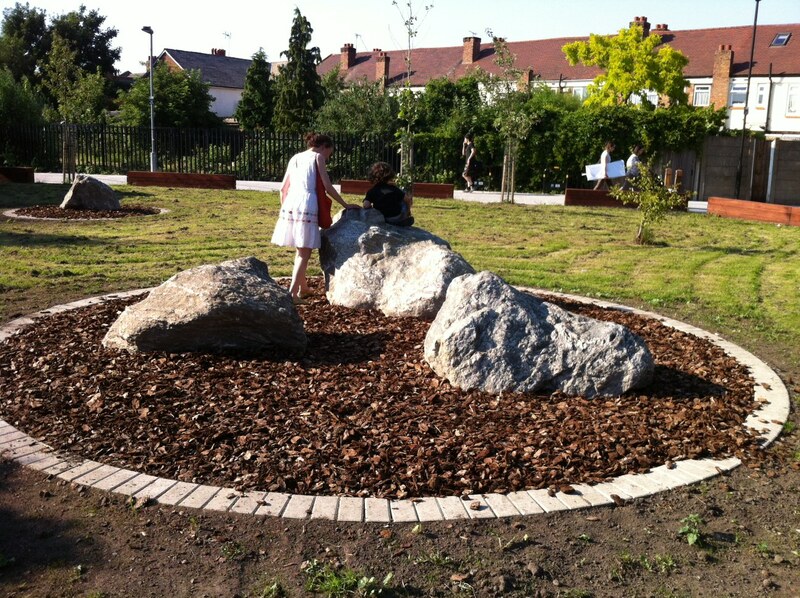 As a result, the area is now less cluttered, fruit trees have been planted, rail lines have been set into the path to provide a memory of the old Palace Gates Railway, the old fence was removed and replaced with a permeable line of ‘railway sleepers’, and a set of boulders installed to allow kids to play on their way to school. What next for the green space? 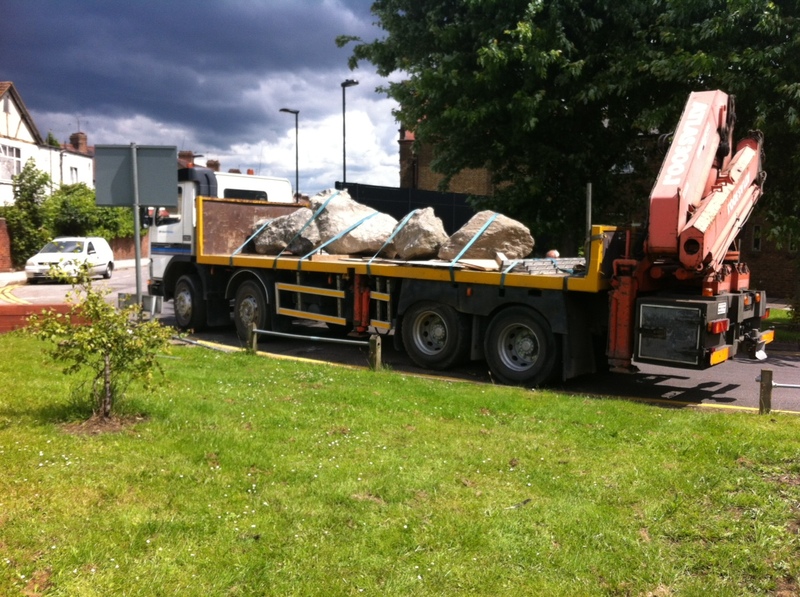 The boulders arrived today for the green space near the allotments at Langham Place. They have been placed in position and tomorrow the contractors install bark, the railway plaque, the new post and rail fence, and remove some street clutter (including the large yellow parking sign). There are a few other elements, but I am waiting on confirmation and will post information as soon as it is available. 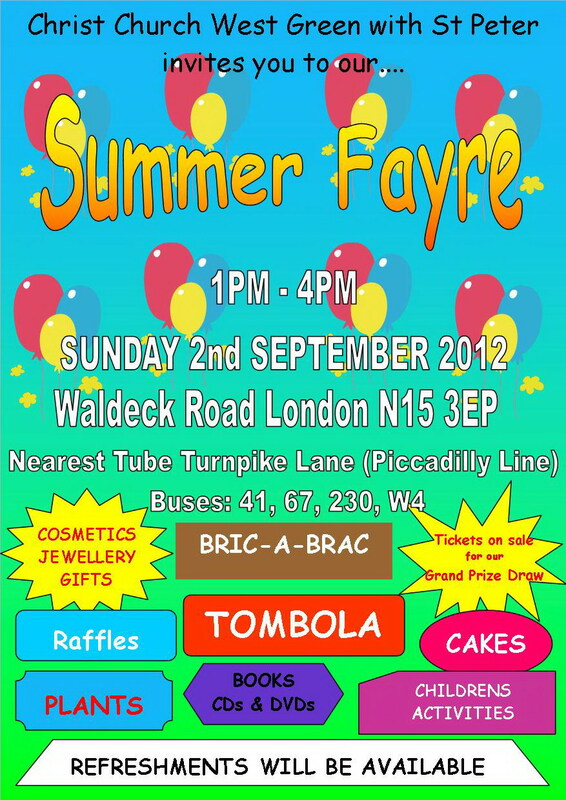 Raffles, tombola, bouncy castles, coconut shy, fresh coffee stall, cake stall, homemade food, bric-a-brac, ice cream, 2 x 2 live shows for kids, singing from the Tottenham choir, crafts for kids, bee keeping, Wood Green animal shelter, face painting and much more!! Please not that there will not be access through the back of Belmont Rec, but please come around to the front of the school which is on Rusper Road. I am sure many of you have noticed the incredible mural, by the world famous Shepard Fairey, that has gone up on the previously dilapidated advertising board on the side of Turnpike Stores. A group of residents have worked tirelessly to make this happen and it just shows what is possible when you come together as a community. 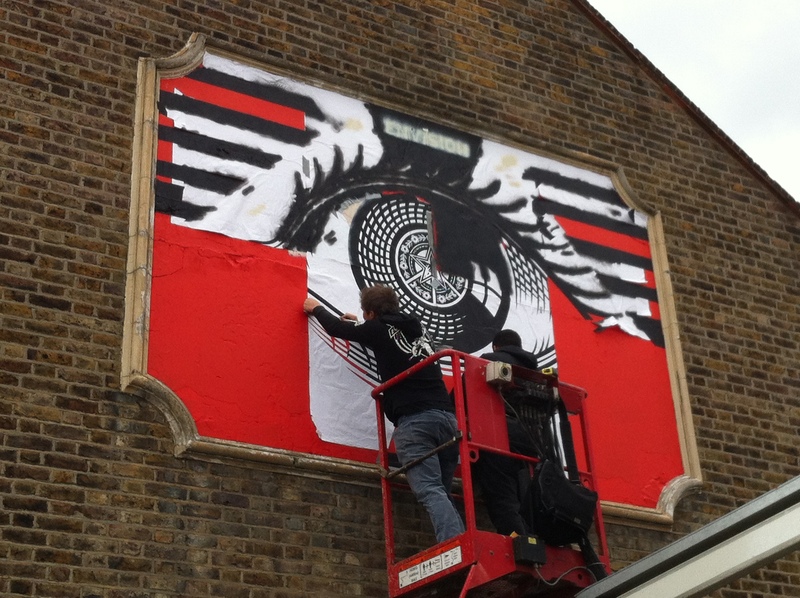 The mural has brought considerable positive attention to Turnpike Lane on the internet and social media. Please let me know if you want to get involved in any potential future works and I can pass on your details – or join up to the neighbourhood facebook group (link on right side of website).